(Mississauga) On the blessed day of Eid Milad un Nabi (the birthday of Prophet Muhammad, peace be upon him), the thirty four Imams and the Islamic leaders affiliated with the Islamic Supreme Council of Canada have issued the following Fatwa reminding Muslims that honour killings, domestic violence and misogyny are un-Islamic actions and crimes in Islam. These crimes are major sins in Islam punishable by the court of law and almighty Allah. We, the undersigned Imams, are issuing this Fatwa as a reminder to the Muslims of North America regarding the issues of domestic violence, honour killings and misogyny in our society. The recent Shafia family trial in Kingston, Ontario has reminded all of us that we need to do more in order to prevent such tragedies in future. There are some Muslims who would commit a crime and then use Islam to justify their crime. According to the Qur’an the biggest liar is the one who tells lies on Allah. Honour killings, domestic violence, misogyny, spousal abuse, child abuse in all forms are forbidden. The relationship between the husband and wife is based upon mutual love and kindness. In the event of a family dispute, the Qur’an urges husbands to treat their wives with kindness. In Islam there is no gender based superiority. In fact, the relationship between a husband and wife is based upon mutual love, respect and care. Some people quote the following verse from the holy Qur’an to prove that a man has superiority over his wife. The above verse is not about the superiority of the man. Rather, it is about the greater responsibility of the man in running the home such as fulfilling the food, shelter, clothing, education and safety needs of family members. The Qur’an recognizes gender equality. The idea of superiority is based on honesty / piety only. “O Mankind, We created you from a single (pair) of a male and a female and made you into nations and tribes, that you may know each other. Verily the most honored of you in the sight of Allah is he who is the most righteous of you” (49:13). We would also like to clarify the translation of verse 34 of Surah Al Nisa. Some translators have the Arabic word, “wadhriboo-hunnah” (وَٱضۡرِبُوهُنَّ) translated as “strike” OR “hit” (with toothbrush). In our opinion, this is not the correct translation. In a case when a married woman develops a sexual relationship outside the marriage, the Qur’an requires the husband to follow three steps and not to become violent. Here is the correct translation of verse 4:34. In Islam, obedience of Allah is NOT acceptable to Allah unless the person does it with his or her heart. In Islam the reward of a good deed from Allah depends on a person’s intention. If the person is forced to do certain things against his/her will then there is no reward from Allah. Therefore, beating or abusing a family member in order to force them to follow Islam is not acceptable to Allah. Parents have the responsibility to educate children about the teachings of Islam but they have no right to abuse or harm them. They need to be a role model for their own children. The Prophet Muhammad (peace be upon him) said, “help the oppressed and the oppressor”. People asked the Prophet Muhammad (peace be upon him): “We understand how to help the oppressed, but how should we help the oppressor?” He replied, “By stopping him from the oppression”. In Islam, if a person commits un-Islamic actions (crimes) an institution with authority, such as the police, courts or government, can punish that person – not family members or other private citizens. Honour killing is a major sin in Islam. Those who commit honour killings should face the justice of this world, and they will face Allah’s justice too. Those who cause harm to a family member or anyone else because they believe that the family member or a person have brought disgrace to them OR their honour has been damaged by the actions of a family member commit a major sin / crime by taking the law into their own hands. Only the court system of a country has the authority to decide guilt or innocence, and punish a person, not the family members such as the father, mother, husband, brother, etc. 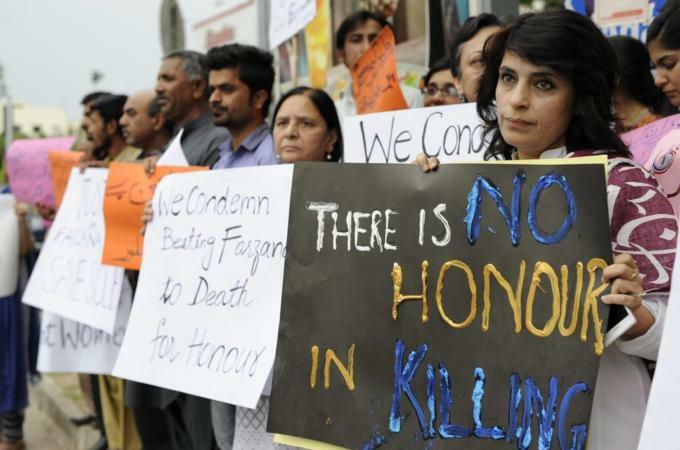 Honour killing is an un-Islamic practice which has roots in paganism. In Islam, killing or hurting someone in the name of honour is a criminal act which should be punished by the court of law and it will be punished by Allah on the judgement day. Domestic violence is a huge problem across the world. We believe it is not a Muslim problem. It is a human problem. Domestic violence crosses all boundaries. Domestic violence exists in the developed and in the developing worlds. Domestic violence takes place in Christian, Jewish, Muslims, agnostic, Buddhist, Hindu, atheists, etc. houses. It is everywhere. However, as Muslims we must follow the holy Qur’an and the teachings of the Prophet Muhammad (peace be upon him) which forbids causing harm to children, wives or any other person due to disagreements, disputes or conflicts. All family issues must be resolved within the laws of the country we live in. As the Imams and religious leaders in the community we have an obligation to inform everyone that Islam condemns domestic violence, honour killings and misogyny. We offer every Muslim family in Canada and the United States the support and guidance they need if a family member seems to be violating the Islamic code of conduct. However, we want to be very clear that no one, except the Canadian/American courts, has the right to punish anyone. It is the requirement of Islam that citizens must follow and respect the laws of their countries. Therefore, Muslims who live in Canada must follow and respect the laws of Canada. Similarly, American Muslims must follow the laws of the United States. On this important day of Eid Milad un Nabi (peace be upon him), the Islamic Supreme Council of Canada announces “ISCC Families Network” project, which will be rolled out across North America in cities where ISCC’s affiliated mosques and organizations exist. This network will work with the young girls and the boys and their parents to help and guide them in resolving issues and conflicts. This network will establish separate girls and boys clubs where they can discuss issues and share their experiences at home, at school and at work. This network will establish working relationships with the police, teachers and other mainstream Canadian and the American organizations in the field of domestic violence, racism, discrimination and bullying. All the services provided by this network will be free to all families. We pray for the victims of domestic violence and honour killings especially the victims of Shafia family. We extend our full support to the victims of domestic violence. We request all the Canadian and the American Muslims to join “ISCC Families Network”. May Allah guide us and protect all of us from the evil of Satan and the wrongdoers. Ameen. Note: We are in the process of getting more endorsements from various Imams across North America. Their names will be posted on ISCC’s website. 31|7|And when Our Verses are recited to him, he turns away in pride, as though he did not hear them, as though there is deafness in his ears. So inform him of a painful punishment.